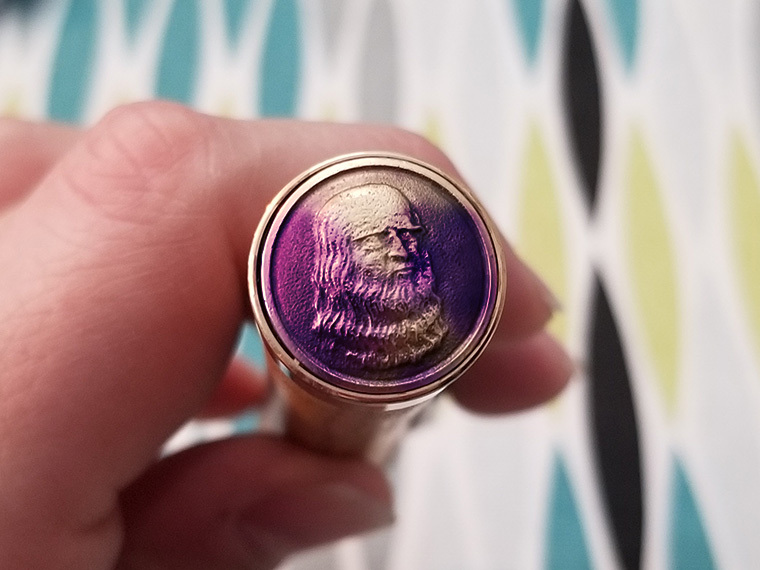 Nearly a year ago, I wrote about the DC Pen Show and shared my favorite fountain pen story: how I got pen #19 of 88 of the Stipula Etruria Prisma 88 limited edition. It’s been my favorite pen story every since, but it has now been dethroned by the story I’m sharing with you today. 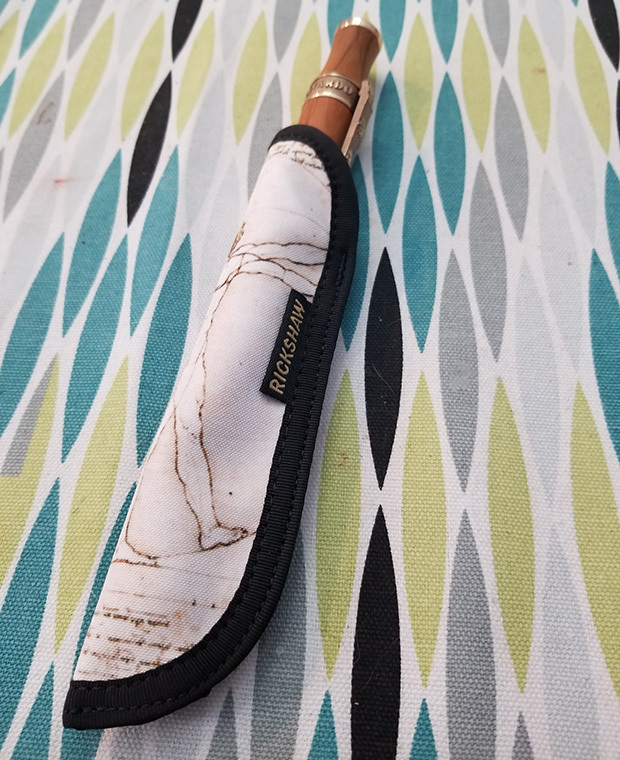 Allow me to tell you the full story behind my acquisition of my grail pen. 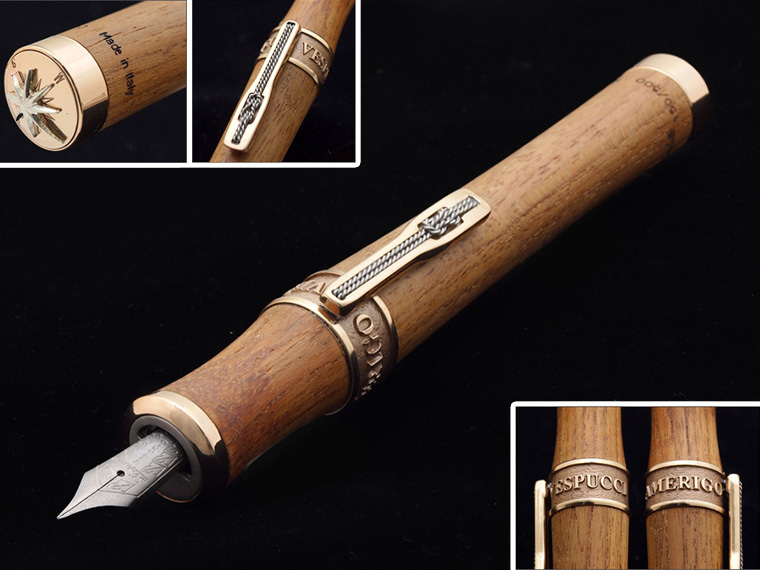 Stipula Leonardo da Vinci olive wood limited edition (photo from Rakuten). Photo modified to be more true to life. 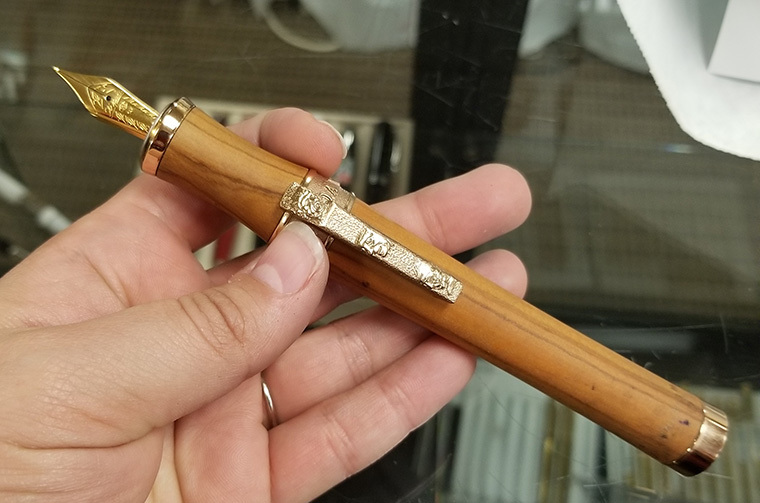 I honestly, at this point, can’t remember when I first discovered the existence of the Stipula Leonardo da Vinci (LDV) olive wood limited edition. But when I found it, my most expensive pen was my Lamy Safari Dark Lilac, and the thought of spending so much on any pen, even one as fascinating as the LDV was preposterous to me. Don’t judge, I was “young and foolish”. Fast forward to just before the DC pen show last year. Bertram’s Inkwell was having a second-hand sale. If I recall correctly, the available pens were “showman’s models” meaning, as I understood it, they were the pens that sat out on tables to be tested. I may have misunderstood, but that’s not what’s important. Among the pens was an Amerigo Vespucci. Essentially, the Amerigo Vespucci is the same pen as the LDV. It’s only the details that are different. 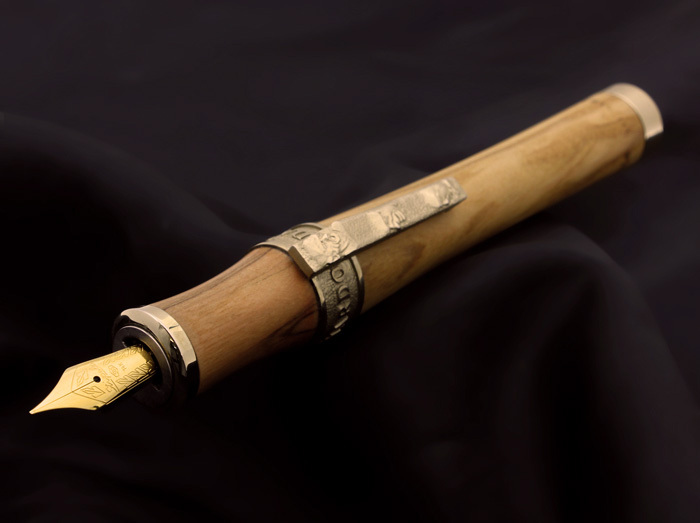 Stipula Amerigo Vespucci limited edition (photo from Rakuten). I seriously considered buying that pen. I must have picked up up and played with the mechanism at least ten times. I admired all the detailing, from the knot on the clip to the compass on the end cap. I checked out the cartridge placement (after I asked where it was). 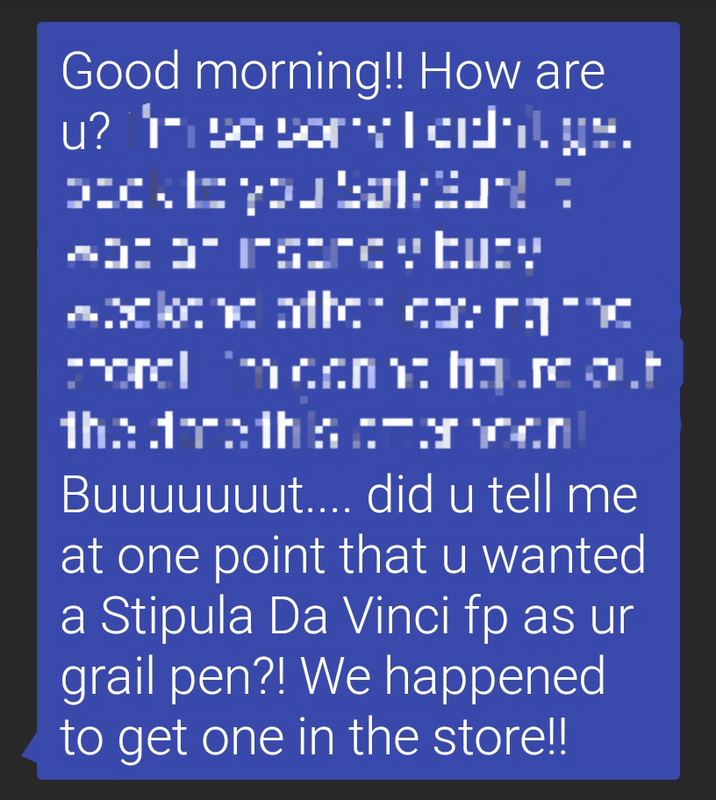 But at the end of the day (well, when we were ready to leave the store), it wasn’t actually the pen I wanted. I have no real interest in Vespucci. So I put it back one final time and walked away from it. Over the next few months, I casually looked for the LDV. 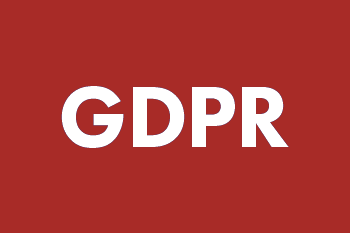 But every Google search turned up nothing. My saved eBay search didn’t turn anything up for months. Owning the LDV wasn’t about finding one at the right price, it was about finding one, period. And so, gradually, the LDV worked its way up to grail status. I view grail pens differently than a lot of people do. I don’t considering something a “grail pen” because I’m going to hunt for it. Instead, what earned the LDV grail status is that I assumed, like the grail of legend, I’d never find it. Then, in May, during one of my random Google searches, I got a hit. Amazon had one in stock, sold by Stipula for $495. I stared at the screen. No way could it be true. I closed the page, shaking my head. But I couldn’t help myself. I went back to the page less than ten minutes later. It was still there. I called Jim and we discussed the pros and cons (sort of). As I saw it, the worst possible outcome was that I’d get the wrong pen, and then I’d just ship it back. Easy peasy. I knew I had to at least try to purchase it. I placed my order and received an email with the notice: Delivery date pending. We’ll email you as soon as we have a delivery date.” Not a good sign. I waited a week and a half, then emailed the seller. A day later, I got sad, though not wholly unexpected news. The pen didn’t exist. A “computer error” had resulted in one showing up as available. But, I was told, if I wanted to wait, they’d let me know when they got more in stock and give me a $25 Amazon credit. I had a good laugh at that. Like they’d ever get more in stock. I cancelled my order, disappointed that my long shot hadn’t worked out. That Saturday, I shared my tale of woe at Bertram’s Inkwell, because I knew they’d understand. Adam, especially, sympathized with my disappointment. Fast-forward to the 9th. I get the following message and photo from Adam, and my heart stops. Jim and I had been in the store just two days before. Bert was down in Roanoke finalizing the purchase of a 200 pen collection. This was one of those pens. I could hardly believe that my grail pen had appeared. I’d written it off as a pipe dream. I never expected to actually own it. I thanked Adam for thinking of me, and asked if they’d hold it until Saturday. Then I remembered to ask the price. The answer: Yes, they’d happily hold it, and the price was $395. That’s half the original list price. I examined the photos. The pen clearly wasn’t in great condition, but the body is wood, so Jim and I were both hopeful that it could be cleaned up. After the longest week I’d had in a while, Saturday finally rolled around. I was incredibly pleased, upon making it to the store, to find that the wood wasn’t as badly stained as I feared. The end cap, though, was badly stained with what I think was blue ballpoint ink because it had that characteristic purple sheen. On the plus side, though, every time I wiped it, more ink came off. This is a Photoshop mock-up of approximately what the staining looked like on the end cap before cleaning it. After a quick discussion with Jim, I was fairly confident I could restore the pen to at least a decent appearance. And the chance that I’d find another LDV, much less at that price, seemed astronomical. So I bought my precious. 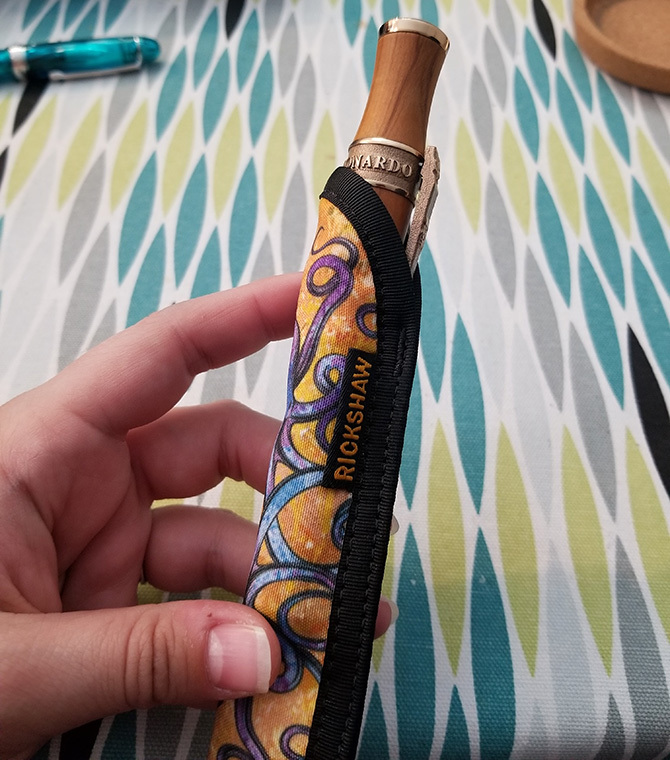 Unfortunately, I was so excited to actually have the pen at the shop, and so eager to start restoring it once I got home, that I didn’t take any proper “before” pictures. I only have the two below. In the video you can see some lighter and darker splotches as I turn the body. You can see some of the staining near the end cap. I spent somewhere between an hour and an hour and a half cleaning up and restoring the LDV with Jim’s help. I gave the body a light scrub with baking powder, which removed most of the staining, as well as a lot of surface grime. Time, patience, baking powder, a bit of vinegar, and a soft toothbrush got the end cap completely clean. Jim and I were both amazed at how well, and how easily, the pen cleaned up. I tested various high-grit sandpapers to get the last bit of staining off the body. I worked my way down from 10,000 to 2,000, not wanting to use anything too rough. But a light hand with the 2,000 grit removed all but a tiny dot of staining next to the Stipula imprint. I probably could get rid of it as well, but I’m afraid of “erasing” the S in Stipula. All of the cleaning, however, left the body very dry, so Jim gave it a good rub down with wood conditioner. It made a huge difference, both in texture and the vibrancy of the wood. He gave it another rub down about a week later, and we’ll probably keep applying a thin coat once a week until it stops drying by the end of the week. That poor pen has been through a lot. Here you have the “after” photos, showing its final condition. I’d place it firmly in the “gently used” category. So now, I’m the proud owner of my grail pen, thanks to the outstanding customer service at Bertram’s Inkwell. But if you’ve read my review of the store, you probably aren’t surprised. I can’t thank Bertram’s Inkwell, and Adam in particular, enough. This is really just one example of why it’s beneficial to visit your local pen store. Here it is after about an hour of TLC from myself and @pensloth. But it doesn’t fit in my Inktapus. 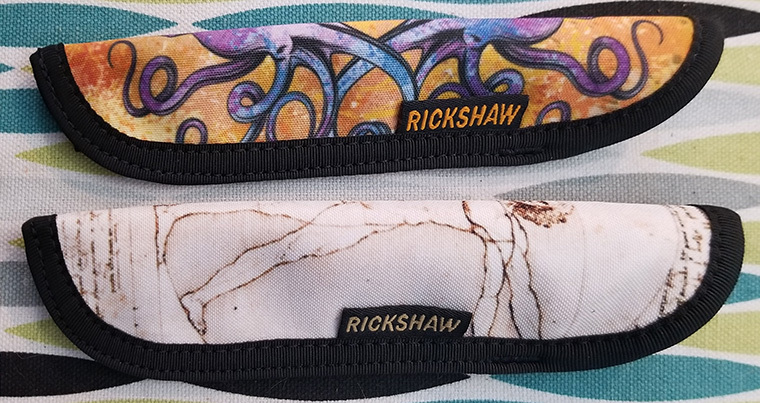 😔 @rickshawbags, do you make single custom sleeves? I’d need it about a half in wider. And Rickshaw Bagworks answered in the best way. 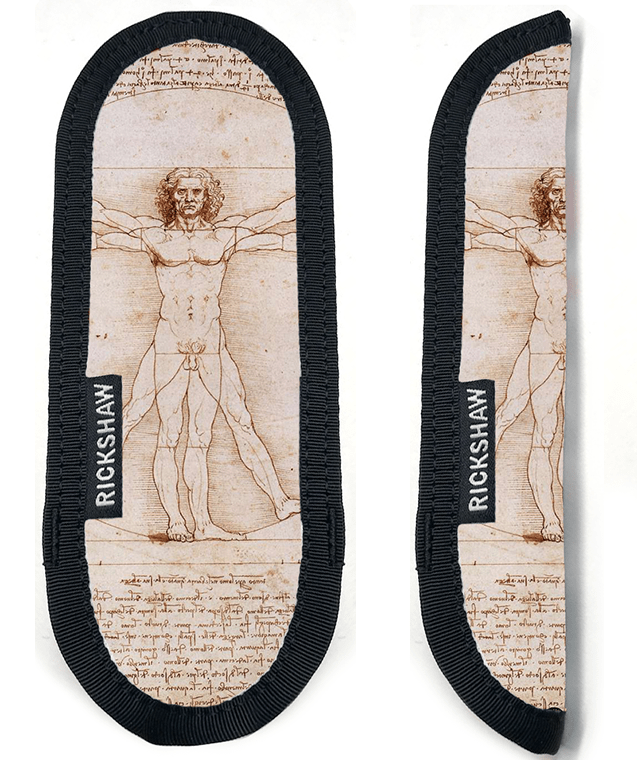 After a short discussion, I created a mock up of a Vetruvian man sleeve and succeeded in convincing Mark to make me one. 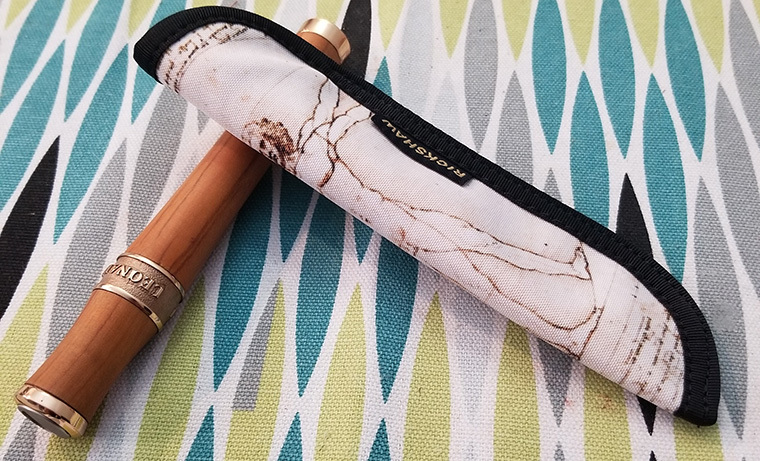 A comparison of a standard pen sleeve and my custom sleeve. Now my LDV has a perfect home to keep it safe over the years. So A+ to Rickshaw as well. I hope you’ve enjoyed my new favorite pen story. If you have your own favorite pen story, let me know in the comments.